Friday night pizza has never been simpler. I picked up a pizza dough from our favorite pizza place and a few toppings at the market. In less than 30 minutes we sat down to a pizza that’s better than what’s delivered to your door. This combination of toppings was sensational. Creamy cheese, spicy italian sausage and the kick of italian long hot peppers, unbelievable! Getting the dough from your local pizza place makes this process less of a project. For this pizza I used a perforated metal pizza pan instead of the pizza stone. I think it was even better. Crisp, evenly browned crust and bubbly toppings. Yum! Preheat the oven to 475 degrees. If using a pizza stone, remember to preheat the stone with the oven. Remove the sausage from the casing and break apart in a frying pan. Cook over medium high heat, breaking into small crumbles. Remove from the pan when cooked through and lay on a paper towel to drain. Set aside. Sprinkle a large cutting board with flour and roll out your pizza dough nice and thin. I like to move the dough onto a pizza peel before adding the toppings… it makes transferring the pizza onto the stone in the oven easier. If you are using a metal pizza pan, you can place the rolled out dough onto the pan at this point as well. Evenly sprinkle the ricotta cheese over the dough. 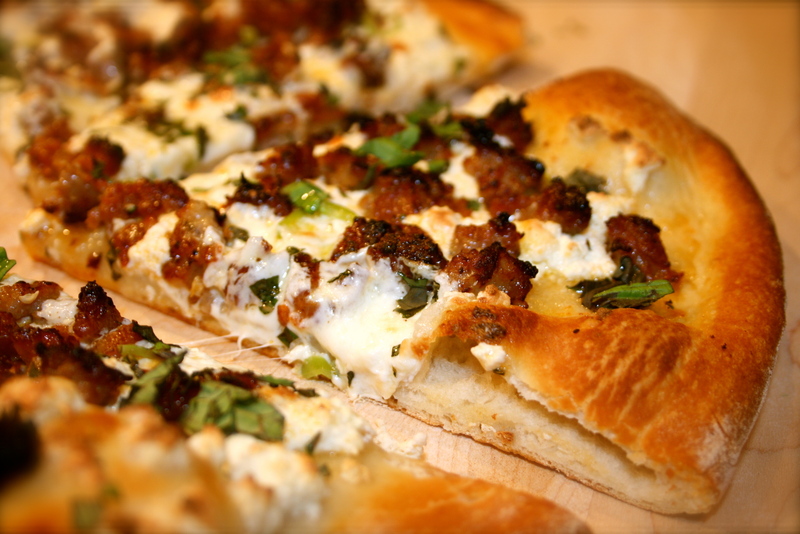 Do not cover the entire dough with the ricotta, it’s just an even sprinkling – the cheese will spread out as it melts. Lay on the sliced mozzarella, the fresh garlic, sliced long hots and the crumbled cooked sausage. Top with a little parmesan and a drizzle of good olive oil. Bake in the oven for about 7-10 minutes until golden brown and crispy. Remove from the oven and toss over the chopped basil and give it a final drizzle of your finishing oil. Serve with hot pepper flakes on the side for a little extra zip. Delicious!!!! * I used fresh ricotta from our specialty market. It’s much creamier than the grocery store ricotta. I think it makes the pizza extra special. If you can get your hands on some fresh ricotta cheese, give it a try. Thanks! I’m glad you found my blog. I’ll check out your site too. Have a nice weekend! Now now, you ought to make your own pizza dough :D. It;s good you got it from a nice, local place though. It looks like a really delicious pizza! I have at times made my own dough, but in a pinch purchasing a dough from a great pizza place to help get dinner on the table for the family is a great option for many home cooks. Here is my previous pizza post with the recipe for pizza dough I have used in the past. https://4plates2table.com/2011/09/06/pizza-night. Thanks for checking out my blog. The pizza was delish!